This message was actually channeled last month in my Patreon page, on the 12th of March 2019 (powerful 3-3-3 date). Following Father Mother God's request that I'd received today, it is now made available free for everyone to read. Namaste. All of you have a very important role to play to ensure the success of Earth & the Human Collective's Ascension into 5D. You, through the mission/purpose you had chosen for yourself & that we had helped create, are meant to awaken many people and show them the path back into Our arms of Infinite Unconditional Love. The path that you will show others may be different from another Light-worker's, and that is by design. Your heart is the purest of The Pure. Your bravery, courage and strength are legendary; famous and greatly known throughout Heaven. Your willingness to be of service to us, your Father Mother God, and to ALL in existence, is constant and never-changing. Your mind, heart and soul beat as one with Ours. Our Will is your will and your will is Our will - for we speak as ONE. We act as ONE. The majority of the time, you had chosen to raise the consciousness of the entire Human Collective, by spreading messages of Love, Freedom, Compassion, Peace, Abundance, Joy and Oneness - in one way or another. Some of you here had died many times in service to the Light or, had greatly suffered for your faith/belief in the ONE God and for spreading Our messages. You had also in the past, decided to play the roles of people who were top leaders of nations, religious groups, ruling societies - to change humanity's 3D ways of Be-ing from within. You were playing the role of someone born/naturally meant to be within those, usually, exclusive communities. In other words, you were often our planted 'spy'; Our agent of Light and Love, in organizations where Light and Love were either non-existent, or, so conditionally 3D as long as you constantly 'obeyed' the organizational rules/regulations. Even when your life missions had seemingly failed (when viewed from a lower-dimensional perspective), you never faltered nor gave up. In fact, We are here to tell you that all your missions, woven throughout the Fabric of Time (to raise Humanity's consciousness) were a complete success! Every single one of them was a success - when viewed from a multidimensional, Higher perspective. We could easily see how your words, feelings, thoughts and actions had rippled out globally, raising the consciousness of ALL from a primitive level (that was all about survival of the fittest) to the highest level where it currently resides (gradually changing to all about service to Light & Love). Humanity's consciousness (a.k.a. the Light Quotient Level) is now the highest it has ever been, ever since the last great Golden Age of Atlantis. And this success can be greatly attributed to all of you reading this today. For example, some of you here were instrumental in permanently abolishing slavery. Some of you were responsible in the awakening of the energies of Divine Feminine in the world, without which Ascension would not have been possible. And you did this by standing up for women's rights as victims and/or as their protectors. Some of you here had been the guardians of the Flames of Freedom, Justice and Liberty in ways that you cannot fully comprehend/remember just yet. As a Nexus Planet, what happens to Earth will soon reverberate and likely happen to many other planets as well. Truly, at the risk of sounding dramatic when saying this simple truth, the fate of the entire galaxy hangs in the balance (as you may remember from one of the teachings shared in Adele's spiritual group meetings last year - if you were a member then) and Earth is the key. And this, our beloved, is the sole reason why you are here. Earth is receiving so much of Heaven's support (the scale of which has never occurred elsewhere in this universe before) because what happens here will truly affect trillions of other souls within this galaxy. And of course, if we were to view it from a Universal perspective, what is happening right now on this one small planet, called Earth, located in the outer reach of this galaxy, will have tremendous after effects the likes that none has seen before. In fact, not long after the exact moment of Earth & Humanity's Ascension to 5D, this entire universe will be uplifted and raised in consciousness to a level that we have greatly desired but can only dream of having so far. This is the 'Great Correction' that highly-evolved beings (who are in charge of this particular universe) had meticulously planned with every single one of you here who had attended the Great Conclave (as your Higher Selves), and now, positive results are showing. And we cannot be happier! Massive celebrations are being held everywhere, loved ones - as your Family of Light celebrates your successes with deep gratitude & overflowing joy. Truly, if you could see yourself (not as the seemingly small microcosm of Light that you once thought yourself to be) as Great Beings of Light - who had achieved what many (highly-evolved Beings in Heaven's Hierarchy) had once thought was impossible to do/achieve - just as we see you, then your life will be so much different right now. It is also time to leave behind all doubts, mistrusts, hurts, fears, worries about working for the Light; working for God/your Higher Self. We are your eternal partners in this massive planetary ascension project. If you have any lingering negative/mixed feelings about what you are being called to do from this point onward, please put those burdens down and walk forward in your paths, completely unencumbered by the 'ghostly, energetic remnants' coming from the weight of what had happened in your many past lives. The past lives that you had chosen and designed for yourselves. This is also THE lifetime where ALL of you reading this, are very much the physical representatives of your God-Self; the Higher Self that is as Omnipotent, Omniscient and Omnipresent as I AM. And as your Higher Selves' physical embodiment in every way, the task falls upon you for you to master your Spiritual Mastery sooner rather than later. KADOSH, KADOSH, KADOSH, ADONAI, TZ'VAOT. 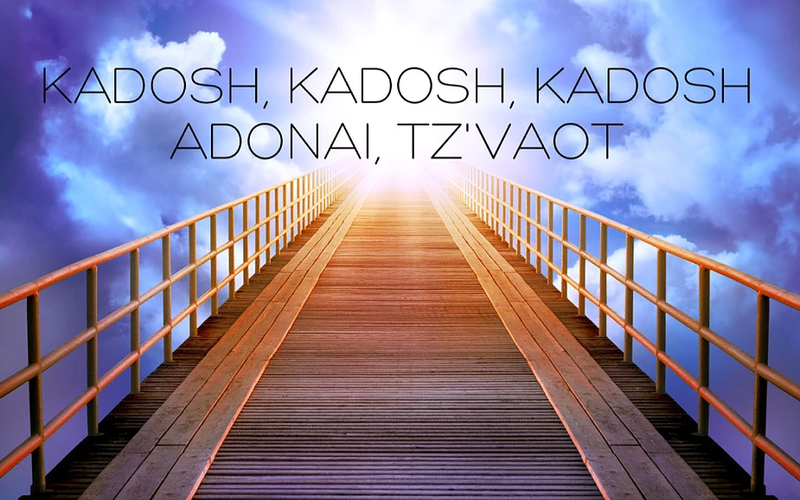 The first one (Kodoish) is the westernized version, and the latter (Kadosh) is the authentic, Hebrew version. Both are powerful, but we would highly recommend using the latter version for greater effectiveness. Hebrew is one the few ancient languages used as 'keys' to activate Higher Consciousness on Earth. So it should come as no surprise that this key must be spoken in its origin language of Hebrew - and not its English translation. And this is due to Light vibrations of Sound, coming from this powerful Mantra. We are here for you always - ready and waiting for you to return to the full embrace of your unblemished, magnificent Self. The Self that is gloriously powerful and mighty; the Self who actually revels at the magnitude of the tasks before them, as opposed to the small self, who is perhaps trembling in fear/trepidation. Channeled by: Adele Arini. Copyright 2019.